In the year 1994, the pioneering designers of the Universal Series Bus (USB) only intended to standardize peripheral connections, but today, it’s blown up into the gold standard for ports on just about every single device in the world that uses computer technology. USB technology has come a very long way since the 1.1 model that could only work at 12 Mbps, and today, it can be delivered a long way from any corner of the globe to find a place in your home to you with next-generation data transmission capability. The following USB hubs have been rated as some of the best available for purchase online because of their technological sophistication. 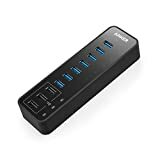 The Anker 10-Port 60W USB hub features an ultra-fast data transfer rate that can reach up to 5Gbps on 7 ports. The hub operates on PowerIQ technology with a top charging speed of 2.1 amps per port, and the other 7 ports are capable of reaching a charge speed of up to 0.9 amps each. The IQ ports are rated for their slightly higher currents, but they’re not meant for carrying data; they are meant for being used to charge personal devices that tablets and phones. At a size that’s roughly equivalent to a pen case, this USB hub provides the user with compact power. Thanks to the compact size, the USB hub allows users to enjoy what it offers while keeping their work space clean and free with as much spare space as they need. To keep the hub ready to operate at all times, the hub has a 12V / 5AC powder adapter. The power adapter is 2.6 feet long, and included with it is a USB 3.0 cable and an instructional welcome guide. The hub supports hot swapping if the user needs to do so. Compatible operating systems include 32/64 bit Windows 10, Mac OS C 10.6 to 10.9, and Linux 2.6.14 or higher. Customers who have Mac OS X Lion 10.7.4 are advised to upgrade their operating system to Mountain 10.8.2 or any more recent upgrades, or the connection could potentially be unstable. Customers are also advised that certain USB 3.0 devices might need to be directly connected to host ports in order to operate properly. 2.4Ghz devices, including certain mice and keyboards, might not be able to work properly with certain 3.0 ports, in which case a 2.0 USB connection might be a more appropriate alternative. As the hub is rated at 60 Watts, and each of the USB ports deliver about 5 volts a piece, the total number of amps delivered by each individual port per current is about 12. If the load on each of the ports is equivalent, then the 12 amps of current capable of being delivered to each port is divided into roughly 1.2; however, keep in mind that each of the IQ ports is meant to carry a slightly larger number of amps than normal, so the three IQ ports will be carrying an amp amount that’s closer to 1.5 amps than 1.2. 1.5 amps carried by 3 IQ ports apiece equals 4.5, which leaves 7.5 amps available for the remaining ports; theoretically, this would equal about 1.1 amps per port; because of this, it’s unlikely that the hub could effectively work with a 2.0 bdr drive that operates at 1.3 camps. To preserve the life of the hub, users should refrain from “fully loading” the Anker 10 point if possible, as its absolute maximum load capacity may not be something that it’s actually meant to maintain in the long run. When the computer isn’t running, the USB 2.0 ports that are color coded as blue will not be powered; at the same time, the other three USB ports are designed to be capable of charging things like cellphones at any time, even when the computer has been powered off. A customer testified that they have tried multiple USB 3.0 hubs in the past, and unfortunately, just about all them wound up needing to be thrown away when they just couldn’t perform up to standard. The customer was on the verge of believing that there was just something wrong with their computer in general, and they’d even gone as far as completely reformatting their USB system. 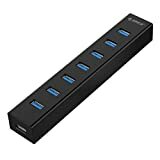 The USB systems continued to fail even after the user had reformatted their entire system, but then they came across positive reviews for the Anker 10-Port and decided to give the USB 3.0 a shot. After trying the Anker 10-Port, the user was pleased to find that none of the problems that had previously vexed them with the other USB ports was replicated. The user described the Anker 10-port USB hub as being perfect in just about every way. The size of the USB port perfectly suited their workstation without taking up too much space. The owner charged their Nexus 7, Nexus iPad Air 2 all at the same time without running into any frustrating hiccups along the way. The customer was able to connect their cameras and external gear, without drivers, without any problems. The Anker 10-Port 60W USB hub’s dimensions are 0.91 x 5.71 x 1.73 inches. The weight of the hub is 1.1 pounds, and the shipping weight is 1.35 pounds. The USB hub can be purchased for $39.99, a 50% discount price from its standard list price of $39.99. All customers who purchase the hub are entitled to an 18-month warranty and Anker’s technological support team. The Atolla Super Speed 4 Port Ultra Thin USB 3.0’s interface supports both hot swapping and plug and play functionality. The interface can support overcurrent protection and instant protection as well, facilitating better survivability for both the USB hub itself and any of the devices that might be connected to it. The power adapter cable is about 5.5 inches long, and an LED indicator that glows blue is used to show the power status. The USB’s data transmission can reach a speed of up to 5Gbps, and it’s downward compatible with USB 2.0/1.1. The interface is completely driver-free. The supported operating systems include Windows XP, Vista, 7, 8, Mac OS, and Linux. One customer testified that the USB hub is highly useful due to the fact that their laptop only has two available USB ports. Another customer testified that they’ve always had to deal with all sorts of problems with their previous USB hub devices, but with the Atolla, they’ve yet to experience any speed bumps or malfunctions. In another testimony, a customer testified that they regularly used the USB hub to connect three different external drives and mouse; each of the devices was able to be connected without the owner needing to make any adjustments or corrections to any of them. 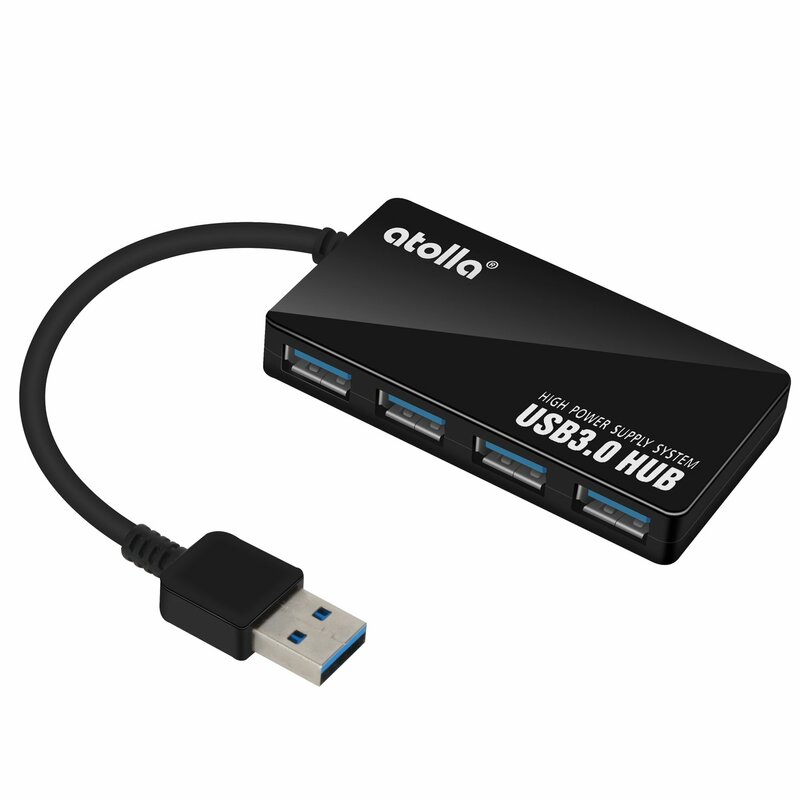 Though the customer initially didn’t know what to expect from the USB hub, they found that the Atolla surpassed all of their expectations for functionality and user support. The customer was particularly impressed with the durability of the USB device, liberating them from the worry that a sudden bump could suddenly incapacitate the device without warning. A common trend in the positive testimonies for the Atolla USB hub is appreciation for the ability to individually deactivate or reactivate any of the connections for the devices with the use of convenient buttons that each signify the current to another port on the USB. With the buttons that can individually deactivate and reactivate any of the individual USB connects to the user’s devices, the user no longer has to manually plug in or unplug any of their phone charges or hard drives. Prospective customers should take note of the fact that the on/off switches are meant to activate or deactivate the individual USB connections, but none of them are designed to turn the USB hub itself on and off. A customer testified that one of their most frequently used devices has 2 USBs, with one of them being used for signal/power while the other one is meant to be used for additional power. The user reported that when the USB with the signal is turned off, the device still received a video signal from it while receiving a flow of power from the other USB connection. In yet another positive testimony of the Atolla USB’s convenience, an owner reported that their most-used laptop only has a single USB port. Rather than resigning to the inconvenience of needing to unplug and plug multiple devices until all of them could fully charge after hours of taking turns, the user was finally able to have them all charging simultaneously without needing to go out of their way. The owner did say that the first impression they got from the device was that it looked cheaply made, but upon closer inspection, they were delighted to find that the lightweight hub was much more technologically sophisticated and durable than they had initially anticipated. The Atolla Super Speed 4 Port’s dimensions are 29.1 x 15.8 x 4.3 inches. The USB itself weighs about 1.1 ounces, and the shipping weight is 2.1 ounces. The ultra-thin USB hub can be purchased for the price of $9.99, a 64% discount from its standard price of $27.08. The interface of the Orico 7-port USB supports the following devices: tablets, notebooks, digital cameras, card readers, U disks, cell phones, PCs, hard disks, Wi-Fi, mice, keyboards, and more. The USB hub is compatible with Windows XP/7/8/Vista, Linux, and Mac OS. Hot swapping and plug-and-play are both supported. The cables that attach to the USB hub are made with a detachable design, including a 3-foot USB data cable and a 3.3-foot power cord. The cables are expandable to 7 USB 3.0 ports, and each of them is protected by a coat of rubber oil. The USB hub also features a blue light comes on whenever the device is powered on, indicating whenever the device is active. There is no need for the user to download any additional drivers or applications in order to enjoy all that the USB hub has to offer. As for the more technical aspects of the Orico USB hub, the 7 USB 3.0 ports each have a theoretical transfer rate of up to 5Gbps. The USB hub is also downwards compatible with USB 2.0/1.1. The interface of the input provides support for USB 3.0 A male, and it’s compatible with Micro USB 2.0/1.1. The VL812 chipset is capable of delivering over-current, over-voltage, and overload protection. As an additional protective measure, the USB power cord is designed to mitigate the risk of unexpected power shortages while the USB is in use. The overall design of the USB hub is very small, lightweight and compact, ensuring that users can transport it easily and don’t run into any significant challenges when it comes to designating a place in their workstation to set the USB hub. Included in every package is one Orico 7-port USB 3.0 hub, one 3.3-foot power cord, one 3.3-foot data cable, one user manual, and service cord. One customer testified that they bought the USB hub to replace their 4-port USB 2.0 hub. The owner was pleased with the convenience the hub offered by allowing them to connect their external hard drives without the risk of running into any of the frequent problems that they’d had with their older USB hub model. The only downside that the customer could think of was the fact that they occasionally needed to unplug and replug their wireless mouse flash drive after powering on their laptop first thing in the morning. The Orico 7-port USB 3.0 hub’s dimensions are 7.4 x 1.3 x 0.9 inches. The item itself weighs 7.2 ounces, equal to its shipping weight. The USB hub can be purchased for the price of $19.99, a 60% discount from its standard list price of $40.00. Each purchase is covered by 18 months of warranty and lifetime technical support, which customers can purchase through the Orico direct store. 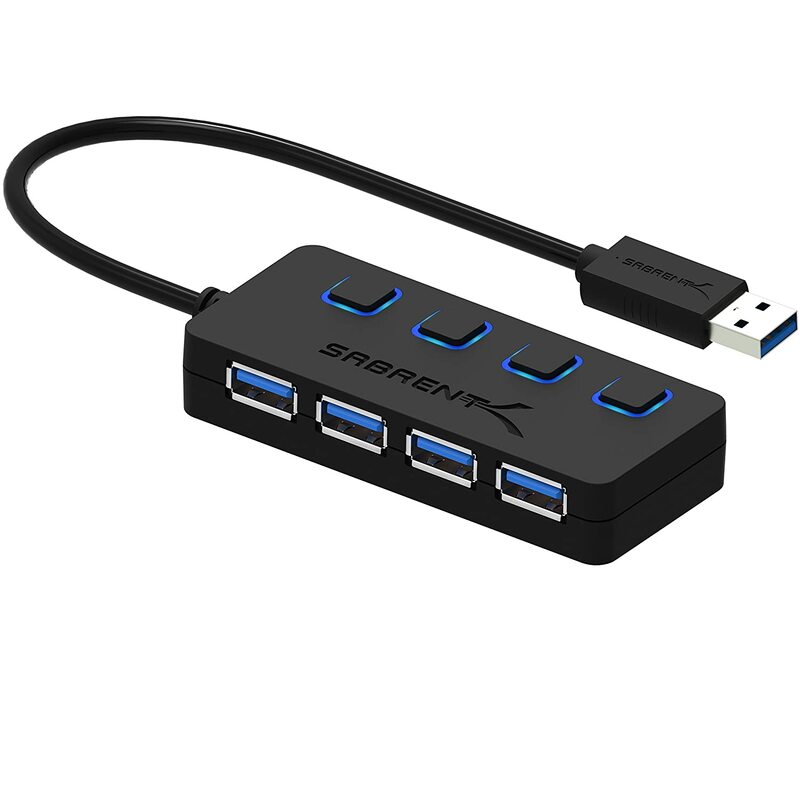 The Sabrent 4-port USB 3.0 hub features 4 output ports and a single input port. The data transmission speed of the USB hub can reach up to 5 Gbps for USB 3.0, 480Mbps for USB 2.0, and 12Mbps for USB 1.1. Both hot swapping and plug and play are both supported by the USB hub’s interface. One customer began their testimony by identifying themselves as a bonafide “gadget freak”, and the functionality of the Sabrent USB earned their seal of approval. The customer was pleased with how solid the USB connections were. The customer attached the USB hub to the face of their tower PC with mounting tape. In addition to being a gadget aficionado, the customer was also an amateur photographer, and they were highly pleased with how the USB hub spared them from the usual necessary evil of constantly disconnecting one device just to attach their camera. Thanks to the ability to power off the L.E.D switches, the user no longer had to hunt for cables. The Sabrent 4-Port USB 3.0 hub’s dimensions are 3.4 x 1.5 x 0.6 inches. The USB itself weighs 1.4 ounces, and the shipping weight is 3.2 ounces. The USB can be purchased for the price of $12.99, a 57% discount from its standard list price of $29.99. Naturally, you’re going to want to make sure that your USB hub actually fits wherever you choose to set it up. Some of best USB hubs will be made with a thin, compact frame that allows them to be easily set up just about anywhere with little to no need to shift things around. Different USB hubs will have a different numbers of charging ports, and the best number for you will naturally depend on the number of devices that you plan on plugging in all at one. First and foremost, you’ll have to confirm that the number of charging ports provided line up with the exact number that you’ll need to accommodate your needs. You’ll also want to take some time to consider the types of power adapters that the USB hub provides, whether it’s a 12V / 5A AC power adapter or something else entirely. Under normal conditions, a USB hub shouldn’t be at risk of taking any heavy impact; still, you want to be sure that your USB hub can still withstand any potential short falls or accidental collisions with other objects. USB hubs can be surprisingly hardy little pieces of technology, so be sure to look into just how far the manufacturers have gone to optimizing the protectiveness of the USB’s outer casing. Different USB hubs will have different maximum speeds at which they can transfer data, and depending on your needs, certain speeds might be better for you than others. Certain USB hubs are capable of transferring more than 4Gbps on multiple ports, allowing you to sync all of your data nearly instantaneously. 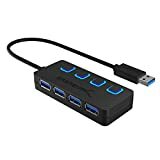 Every active USB hub on your computer is going to consume a small amount of energy, and depending on how many devices you choose to have actively plugged in at any time, the USB’s provided power may or may not be what’s necessary. Before committing to the purchase of any one USB hub, it might be a good idea to consult with an expert and letting them know exactly how much data you plan on transmitting at one time. Beyond the hardware components, different USB hubs will typically run on uniquely different forms of technological interfaces that give them what they need to transfer data at the speed that makes them useful to you. Certain technological interfaces, such as PowerIQ, will give your hub the power to charge up to a certain number of amps per port; knowing this number in advance will let you know exactly what to expect. The development of USB technology since its inception has been dramatic, and today, it’s more powerful and accessible than it’s ever been. Even with how easy it is to get top-of-the line USB hubs today, as there are thousands, it can be just as easy to make the wrong purchase as it is to make the right one. Be sure to get a clear and accurate idea of exactly what your data transmission capacity needs are before you decide on any USB hub in particular, especially when it comes to the number of devices that you plan on running at one time.